Check out the trailer for Kill or Be Killed. The film is released on the 1st March 2016. Co-directed and co-written by Duane Graves (Up Syndrome) and Justin Meeks (The Wild Man of Navidad), the film stars Justin Meeks, Paul McCarthy-Boyington (The Human Race), Greg Kelly (Planet Terror), Luce Rains (3:10 to Yuma, No Country for Old Men), Arianne Margot (Drive Angry), Bridger Zadina (Terri), Deon Lucas (Jacob Stone), Larry Grant Harbin (The Reckoning), Karrie Cox (Tangerine), Edwin Neal (The Texas Chain Saw Massacre), with Pepe Serna (Scarface) and Michael Berryman (The Hills Have Eyes). Kill Or Be Killed will be available on VOD and DVD, at an SRP of $27.97, on March 1, 2016. 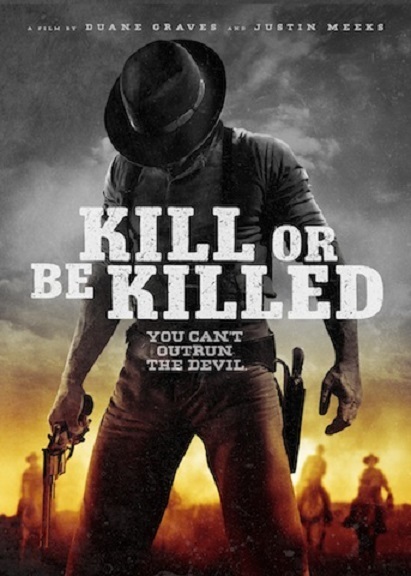 In KILL OR BE KILLED, Claude “Sweet Tooth” Barbee and his gang of cutthroat outlaws – the most wanted men in Texas – are on a desperate ride across five hundred miles of badlands to recover a fortune in hidden loot from their most daring robbery. But Barbee and his crew aren’t the only coldblooded killers riding the range. With a large “dead or alive” cash bounty on their heads, the outlaws are being picked off one by one. What began as a hard journey driven by greed becomes a feverish race to survive.